Jill Of All Trades: Wrath of the pimples! This post takes me back about 10 years, during my teenage days. Life is not easy for a teenager with oily acne prone skin. I suffered from acne since I was 15 years old till the age of 22-23. I still get a random break-out here and there a few times in the year; but that is nothing as compared to what I had before. As a teenage girl, specially once you enter college, you have one great fear: A break-out on an important day - your birthday, a sleepover, picnic, trips, and the sort. If you had a crush on someone at school/college, you dare not show your face to him/her during these nasty breakouts! I remember trying to hide the majority of my face with my tresses. Or applying concealers and makeup to cover these spots (Which for some reason only seemed to make it worse). My hands were always covering my face when someone looked at me. I never believed when anyone complimented me that I looked beautiful, I felt grotesque! It's not that I did not try things. A visit to the dermatologist, who prescribed expensive medicines & ointments while also stating that if it is due to hormones or genes or stress, there was little she could do. Duh! I also took care of my diet, not having too much caffeine or sweet or oily consumption. Home remedies like applying herbal packs, consuming neem, karela, etc had been tried too. I started getting nose-bleeds due to too much consumption of bitter-gourd juice! And having neem leaves was simply too much, it was too bitter. I must have tried at-least 4-5 brands of face-washes made for acne prone skin, with hardly any luck. But then google searches even told me not to wash my face too often. Having to travel in hot and humid climate, pollution, only made things worse for my sensitive skin. 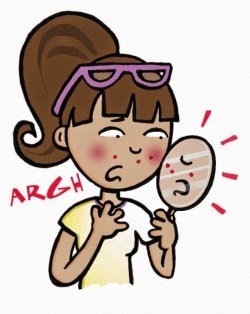 Acne is not only painful physically, it takes a heavy toll on your self-confidence. If I was introvert during those days, it was mainly because of this. And it affects you for the rest of your life. I did not want to have bad memories of myself, I used to actually sit and Photoshop out those horrible spots. Yes. I did that. And felt much better that I at-least looked good virtually. And if all this trauma was not enough, there were relatives who met you and said "What happened to you!?". I hated social obligations, friends at-least understood and empathized with you. I wish I had a magic wand to erase the acne like I did on Photoshop. I wish I had a remedy that actually works! From what I have heard, Garnier's Pure Active Neem Face-Wash really works. I shall surely suggest this product to my younger brother, who is himself going through the same acne issues now in his teenage. Hopefully he won't have to suffer like I did. It affects you for life, after all. Disclaimer: This blog is a part of Indiblogger's contest for Garnier Pure Active Neem Face-wash.